Paesanella Haberfield joined our Mission to help provide access to “Clean Water for All by 2030”. This Mission was initiated by the United Nations. A big thank you to Paesanella Haberfield’s team and customers for joining this extremely important mission on 29 March 2018. 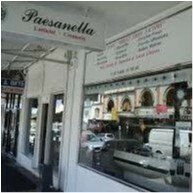 Situated on Ramsay Street in the middle of Haberfield’s vibrant shops, cafes and restaurants, Paesanella Haberfield specialises in high quality Italian smallgoods and cheeses as well as a wide range of imported products. Our staff come from a wide range of backgrounds, but we all share a love of food, of cooking, and of sharing this with our customers. Established in 2001, Paesanella Haberfield has grown steadily for more than a decade and we are constantly looking for ways to improve our product and our service.